Articles that have appeared in Allied Press publication Otago Daily Times from March 2013. The Dunedin City Council has agreed to work with the group proposing a rock groyne that could protect Te Rauone Beach from erosion, to ensure the application for a resource consent contains the best information possible. The Toitu Otago Settlers Museum’s $37.5 million redevelopment is adding to Dunedin’s growing reputation as a nationally significant culture and heritage visitor destination, museum director Linda Wigley says. Presenters were peppered with questions from one councillor yesterday as Dunedin city councillors otherwise whipped through a series of regular financial reports indicating general improvements in council and council-owned company performance. The New Zealand Transport Agency and Dunedin City Council have had talks with Cadbury staff after being horrified to learn large trucks were sometimes driving against one-way traffic to enter the Dunedin factory yard. An interim leadership arrangement for the Dunedin City Council’s finance team is expected to be announced early next week, following the departure this week of the general manager of finance and resources. The managers of the Forsyth Barr Stadium have opened up one end of the venue for use by the community free of charge as part of a $750,000 annual service level agreement with the Dunedin City Council. A 130-year-old former head office and a project to strengthen a 104-year-old student hall of residence are the big winners of Dunedin’s annual heritage reuse awards this year. There are fears Dunedin could lose out to Auckland as a result of proposed changes to the way the New Zealand Transport Agency allocates funding for roading projects. The developer of a Mosgiel subdivision has won the right to name his own streets and pathways, but only after threatening to use hard-to-pronounce Scottish village names instead. If art is meant to provoke a reaction, then the Friends of the Botanic Garden’s proposed 150th anniversary sculpture for the Dunedin Botanic Garden has achieved its purpose before it is even installed. Plans for a South Dunedin library may be accelerated after city councillors pushed for faster progress yesterday. Dunedin City Council funding for the Dunedin Gasworks Museum is ”chewing gum to stick the thing together”, and more than $2.5 million could be needed to save the buildings, the council’s city property manager says. Plans to plug a missing link in Dunedin’s harbourside cycleway near Forsyth Barr Stadium risk creating a ”grand prix” racing circuit complete with hairpin corners, city councillors fear. The amount of fluoride being added to Dunedin’s drinking water is to be reduced within days, after city councillors opted to play it safe despite lingering doubts over the science behind the debate. Dunedin city councillors were forced to grit their teeth and pick winners and losers when confronted with a list of smaller funding requests yesterday. The Dunedin City Council has authorised a $100,000 emergency loan and will seek expert advice to tackle mounting concern over the deteriorating condition of the Dunedin Gasworks Museum. A last-minute bid to increase the Dunedin City Council’s share of funding for a rock breakwater to protect Te Rauone Beach, on Otago Peninsula, has failed. Plans to rejig parking to improve the safety of cyclists on Dunedin’s main thoroughfares have been approved after many questions and some criticism from city councillors. Dunedin Mayor Dave Cull faces a political challenge – possibly from all sides – as the race for the city’s robe and chains later this year begins to heat up. Bankrupt businessman Olivier Lequeux wants to swap the horse stables for the mayor’s office. Student radio broadcaster Aaron Hawkins took aim at the Dunedin City Council as he was confirmed as the Green Party’s candidate for the Dunedin mayoralty last night. Only another $520,000 has to be raised towards a $12.05 million community funding target for the Toitu Otago Settlers Museum redevelopment, thanks mainly to successful fundraising. Are the Dunedin City Council-owned companies out of control, asks city councillor Lee Vandervis. Revelations in recent years regarding our DCC-owned companies’ performances has taken my councillor levels of concern up to serious worry. Despite making 40 people redundant by closing its Christchurch civil contracting business this week, DCC-owned Delta employs 53 people on salaries of $100,000 or more. Dunedin City councillor Lee Vandervis said Mr Cameron was paid more than $460,000 a year and received significant bonuses, ”despite awful financials and ongoing layoffs”. Chisholm Park Golf Club professional Andrew Whiley is to take another swing at local politics in Dunedin. Dunedin’s multimillion-dollar cycleway plans have hit a speed bump after opposition from a group of businesses forced part of the new network to be put on hold. Calls for accountability were met with pleas for a trial before a hanging as Dunedin city councillors considered the failure of the St Clair sea wall yesterday. Public councillors gave their tick of approval this week. Hilary Calvert has joined the race for the Dunedin mayoralty, saying she hopes to cash in on disillusionment with Dave Cull’s performance in his first term. Heads will not roll over the Forsyth Barr Stadium budget blowout, but the total bill could rise again to more than $260 million, it has been revealed. Cr Lee Vandervis said the lack of accountability was ”extremely disappointing”. The traditional last-minute rush is set to begin for Dunedin City Council candidates, as more names emerge a week before the nominations deadline. The race for public office is officially under way after nominations for local body elections closed yesterday. New rules on poker machine numbers in Dunedin could be tightened even further. 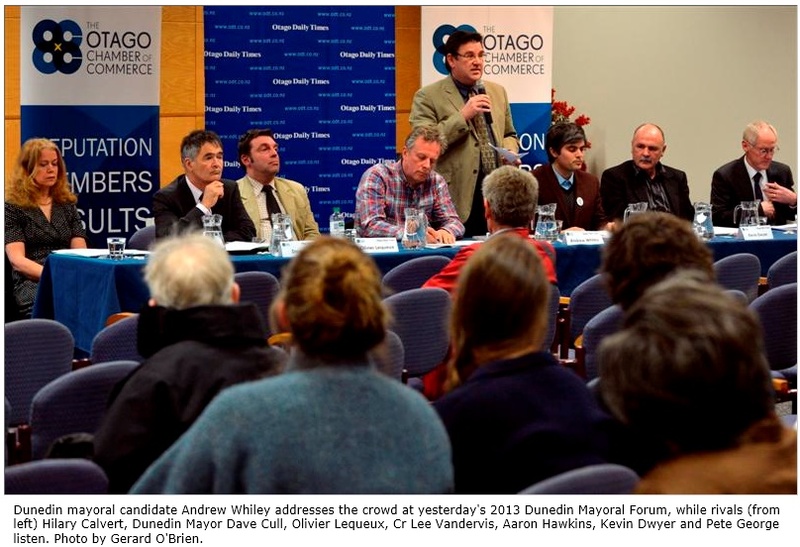 Dunedin’s nine mayoral aspirants did their best to court the tourism sector at their first mayoral candidates forum in the city last night. A radical plan to build a new state highway close to Dunedin’s waterfront – freeing other parts of the city from heavy traffic – could be set for another hearing. Dunedin’s draft transport strategy has cleared another hurdle, despite being criticised again by one of the city councillors considering the 30-year plan. The Dunedin City Council is to consider introducing new 40kmh variable speed limit zones outside some schools. The Dunedin City Council is locked in a tussle with one of its community boards after both claimed rights to money from trees harvested at Walton Park. The return to health of the Dunedin City Council’s multimillion-dollar Waipori Fund should not encourage councillors to consider selling it, the fund’s head has warned. Stockpiled recycling will not be put in the landfill if no new market can be found, the Dunedin City Council says. Perhaps they should do a season. The Fortune Theatre was three-quarters full for last night’s entertaining premiere of the Dunedin mayoral arts forum. Expect a clash of ideas and styles when the nine contenders fighting to be Dunedin’s next mayor square off in public later today. 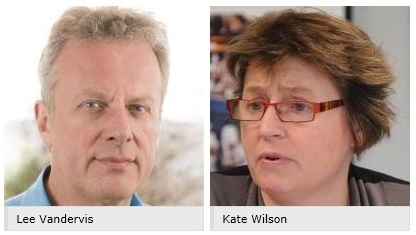 Battle lines were drawn as Dunedin’s mayoral candidates squared off yesterday over the future of the city and its economy. However, Cr Lee Vandervis insisted the city was being sucked dry by debt costs that continued to mount under Mr Cull and his ”Greater Debt Dunedin” team. There have been more last-minute changes to the Dunedin City Council’s draft transport strategy after another fiery debate that brought allegations of political grandstanding yesterday. Dunedin’s newly formed ”cat committee” is already running into controversy. […] Candidates were asked by an audience member if they would consider licensing and registering cats.